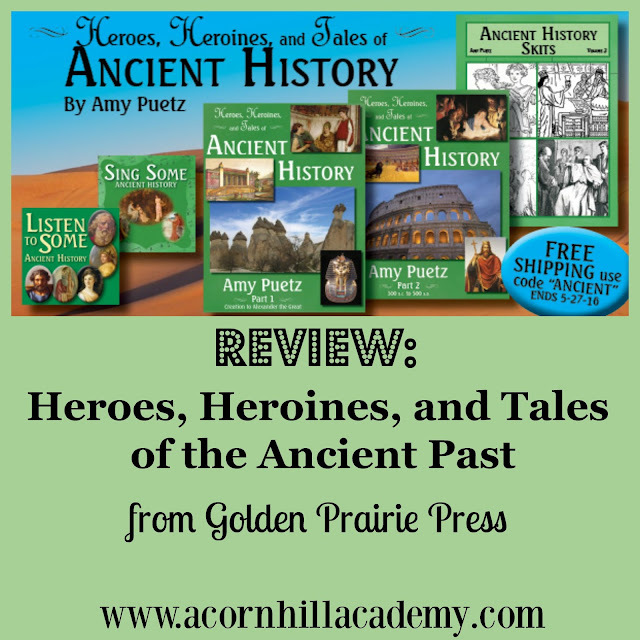 I was recently given the opportunity to review Amy Puetz's latest history curriculum, Heroes, Heroines, and Tales of Ancient History. Amy herself is a homeschool graduate, with a passion for history. She's the owner of Golden Grasses Press, where she publishes her history curricula as well as other books for Christian families. She's also a columnist for Homeschool Enrichment Magazine. You might find her at your local homeschool conference this summer! I reviewed her American history curriculum a couple of years ago, and I really liked it. Heroes, Heroines, and Tales of Ancient History, parts 1 & 2: These are your spine books, each containing 75 lessons. (TOC & Sample Pages) The first book covers from Creation through Alexander the Great, and Part 2 covers from the Hellnistic Age through the Dark Ages. Additional Materials CD: SO much great stuff here! Picture study, printable games, crafts, timelines, and more. There are even pronunciation audio files, so you can figure out those tricksy ancient names. Ankhesenamen, anyone? Ancient History Historical Skits: Fun skits of some of the stories for children to act out. These would be great for a co-op situation! Listen to some Ancient History: Readings of various things, such as a portion of the Code of Hammurabi, Bible passages, and writings from ancient historical figures. Sing Some Ancient History: Recordings of songs you can learn as you go through the curriculum. This is a particular favorite of mine. For the purpose of my review, I received a copy of the digital version, and I really like having that. I lose books all the time, but I can usually find my iPad, so I just put the spine books and audio files on there. The other reason for doing so is that each spine book is roughly 300 pages long, so those are some hefty books to print. If you must have the printed books, I recommend ordering them from Amy and saving your printer. The narrative style of the spine texts: History is much more engaging through a story. I love that some of the readings are tales from the cultures being studied, such as Sargon of Akkad, and Queen Semiramis. Included activities: I can remember spending a lot of time searching the internet for the kinds of activities included here! My son loves to play the games, and anything hands-on is a hit. The organization: Each lesson has suggested activities and notes the location in the course materials. Lessons are noted that might be too intense for some children, and there are alternative readings for those if you feel your children aren't ready. The readings are separated into 1st-2nd-grade readings, which are somewhat simplified, and 3rd-6th-grade readings. Personally, I would just use the readings for older children. Five days per week for history is a lot, particularly when each lesson takes between 30-60 minutes to complete (including activities). However, since it's written for 30 weeks, you can certainly spread it out a bit and still finish in a school year. Other subjects come into play, too, such as picture study and geography. As a side note, the Bible readings are from the KJV, but once you're finished with Creation, they are listed as references most of the time, for you to look up and read if you wish. If you're looking for a complete history curriculum for Ancients written from a Christian perspective, this program is worth considering. Amy's passion for history shows in every bit of her program, and it's obvious she put a lot of thought and care into its design. Also, until May 27, 2016, you will receive free shipping on the printed version. Disclaimer: I received a free copy of the digital curriculum from Amy Puetz/Golden Prairie Press in exhange for my honest review. I was not required to write a positive review, nor was I compensated in any other way. All opinions expressed are my own. I am disclosing this in accordance with FTC regulations.